Let me just start off by saying that I know nothing about tandems so please bear with my stupid questions. I ran across an old Santana that just happened to be the right size for me and my wife (who doesn't know about this yet) and was a pretty fair price (or at least I think it was). I have no idea what model it is though I do think it was made around 82 or 83 guessing by the components. It has been gathering dust in a basement for several years and will need some new rubber, cables and fresh grease but is there any tandem-specific maintenance that needs to be done before riding? I don't particularly care for the brake lever setup which consists of two huge Magura levers that look like they belong on a motorcycle. The right lever runs both front and rear cantis while the left controls the rear drum. I was also thinking of converting it to drop bars for the front which would require new levers and shifters which leads me to another question: is this tandem worth upgrading or should I just get the mechanical bits in order and ride as is? It probably came with drop bars to begin with. Yeah that is old. Apparently Santana have good records and are happy to provide build date information if you send them the serial number. Two brakes from the one lever is dodgy. Most people run the drum brake from a separate thumbie or bar-end shifter. The Magura levers are probably worth something to someone. The bike is likely pretty heavy (ie > 20 kg) but if it fits is probably worth bringing up to date. Drop bars + bar-ends + Tektro 520 brake levers + v-brakes have all worked for me very nicely. Gearing probably half-step + granny and a tight cassette, which may be a bit tall in the modern age. Cranks, derailleurs, wheels sound good. Personally I love to see this old metal given a new lease of life, used and enjoyed. Cable, housings and new rubber and it will be a solid ride. As for the wife part. The stoker as the back seat person is called. 1 - Don't hit bumps. 2 - Do not complain if they seem to not be pedaling. Lastly. The stages of tandem riding. A bit more experienced tandem team. Stoker: I am pedaling harder!!! Stoker: I am pedaling you know!!! Wow, a FIVE speed rear hub. That IS old skool! My main concern is the rear wheel which is NOT a cassette. I'd expect that you not be able to successfully remove the freewheel without destroying it. You might be able to upgrade to 6 or 7 speed. The biggest issue is the rear hub and axle failure. Freewheel hubs have a lot of axle length between the hub and frame dropout (to accommodate the freewheel) which is subject to bending and failure. You'd want to remove the rear wheel and check the axle before riding it. Not a lot you can do, unless you've got wider dropout spacing to accommodate a cassette rear hub/wheel. If you do, you could upgrade to 8-speed which would meld fine with the existing cranks & chainrings. But that gets into expense. I'd only replace the things that are necessary, with perhaps the exception of the brakes. Upgrade them to make them more functional and safe. V-brakes might be the solution. Quality cantilevers would be totally acceptable as well. And yes, separate the front and rear cantis to the brake levers and use a friction thumbshifter for the drum. And replace that R derailleur with a higher-quality, year-appropriate replacement. Deore XT or old XTR would be an excellent replacement. Good luck. It's a beautiful bike with those fillet brazed tubes! Nice photos, lovely old bike. Certainly worth preserving. Probably worth upgrading, especially if you can ID a regular stoker. My wife does not ride with me much, but my mate JB is a regular collaborator and we are pretty good now. Those Magura levers are phenomenal!! 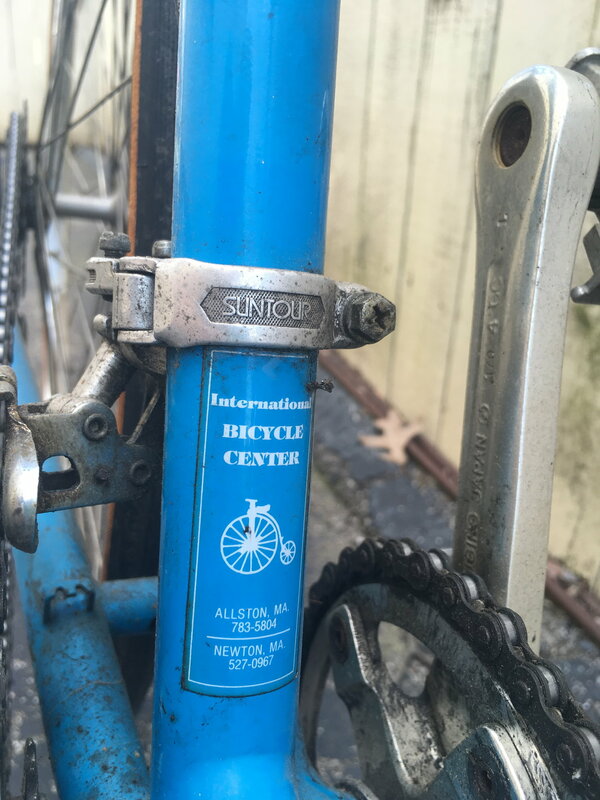 Considering that it has a Sun tour 5 speed rear freewheel; It has to be from the 70's. It should still be fun to ride. You would do well to measure the rear axle spacing. What the spacing is determines your options going forward. Uni-glide hubs are an evolutionary dead end. There is a way to fit a freewheel cassette, but the uniglide lock ring still must be used, IIRC. The uni-glide will be the achilles heel of the whole bike, if you have one. That being said, with a cold set of the stays new tandem wheel options abound. 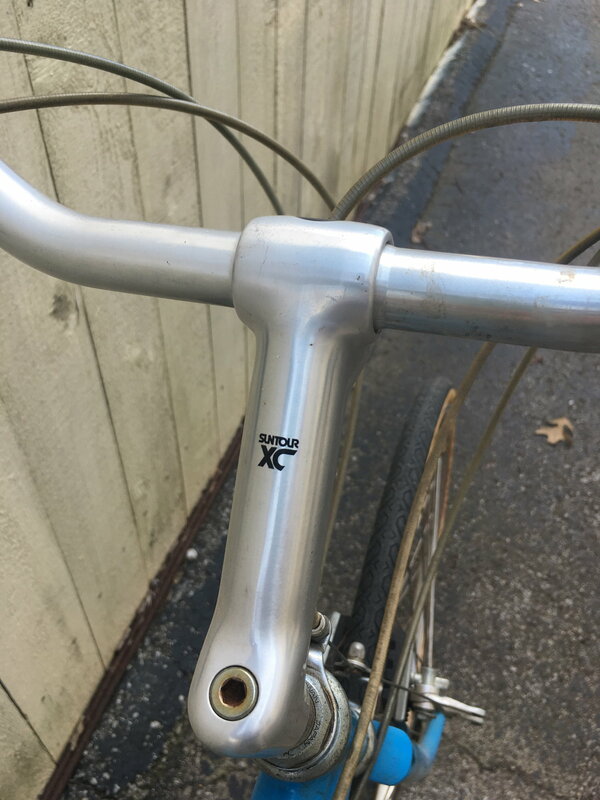 My Trek had stays of 142.5 mm. Right between both industry standards present at the time of manufacture. I bought a 145 Phil hub thinking I could stuff it in there. But the Tandem stays proved too stiff. A cold-set/frame alignment at the bike shop ran about $80. The drum brake is a thing to be appreciated. Very worthy, if you have hills where you ride. Finding a hub to use it...Well my Phil hub ran about $450. $200 for an Arai drum, $100 for the Velocity Chukker, $100 for the build & $60 for spokes...So a grand after tax for just the rear wheel, $1100 if you include the cold set. If you have no hills where you intend to ride, & already have a 145mm spacing, you're options are considerably cheaper and easier to come across. My local shop charges 10-20% more for tandem work. It's just more trouble for the mechanic to work around. I'm not waving you off. Santana is a very well respected manufacturer. I'm just priming your brain that some things can be unique & that can incur unexpected but managable cost. Generally speaking, tandems re-use a lot of mountain bike componentry. If you do your own work, & you don't have a 140mm uni-glide hub...& even if you do, you can get many years & many miles with little to no expense. 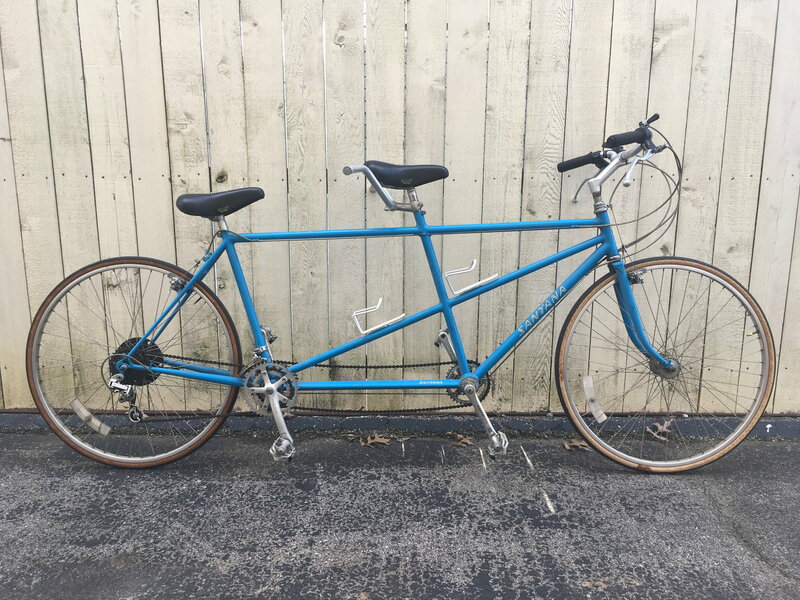 Uni-glide may not have even existed when your tandem was made. That would be a good thing in this context. Enjoy it. Tandems are a blast. Well worth the expense. There is an intimacy with your riding partner that is unmatched anywhere in the cycling world. Last edited by base2; 03-18-19 at 09:33 PM. IMO the only way that bike makes sense is if, as another poster suggested, the o.p. takes care of the cables, brake pads and tires and calls it good. Drop bar conversion? Not this bike; Wide range triple and modern cassette and RD? Not this bike; V-Brakes and ... ... no, just no. I don't know what the o.p. paid for that Santana but I can't help but observe that a late 90's/early 200? 's Trek, Burley, Raleigh or KHS tandem would cost ~$500 and be a better bike in every way. Not anywhere close to being in Santana's league, except for the fact that those lesser bikes being ~15 years old vs being almost 60 years old ... there are some inevitable convergences of functionality. As a means of editing my above post, I'm adding another. I would totally ride this bike until the wheels came off. Then dump "bunches" of money into it. A new tandem worth owning is many, many thousands of dollars. Replacing everthing but the frame would still be 1/2 to 1/4 the cost of new if you went that route, & there isn't even anything wrong at this point and may not yield a better bike than you have now. The rear axle is nutted. That may make replacements difficult to find. Quick release & vertical dropouts is how it's done now. So be careful with you're loading. Freewheel axles are reputed to bend easily. Replacement axles are cheap. In the range of a few cups of coffee. Panaracer Pasela's are the 27 inch tires of choice here at BF. Velocity still makes some wheels new in 27 inch size & alloy. Before you ride, you ought to adjust your eccentric to adjust the timing chain tension. Then as mentioned cable, repack the bearings & what-not. Your brakes are awesome, just get new pads. Tandem brakes are under bunches of additional stress. The large style pads you have last longer & grab better than the ones usually found on regular bikes. Salmon color are better for all-weather use, but either is fine. Steel rims don't brake that good in the rain, but neither does wet carbon rims either, so really, it's neither here nor there. Just something to keep in mind. Don't let the stradle cable drop on to the tire, though. The result is a sudden stop you didn't plan for. That's the reason modern stradle cables are of a different design. All-in-all, of the tandems to get, I would be proud to roll this one around town with a smile & a pretty lady. Last edited by base2; 03-19-19 at 06:48 AM. Thanks for all the tips. I am comfortable doing my own maintenance and repairs so I wouldn't have the expense of labor and I plan on doing a full strip and inspection along with a grease and cable job. I already have a set of 630-32 Gatorskins that need a home so I will probably just use them with a set of KoolStop pads. 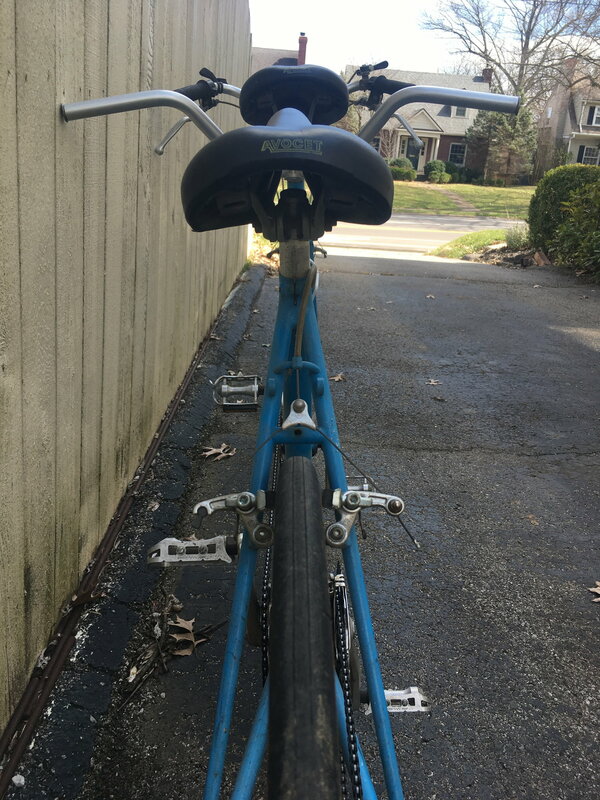 I was just thinking that if I was going to have the bike disassembled and replacing the brake levers anyway that I might put a drop bar up front with a bullhorn in the back but I haven't really decided. I would also prefer quick release hubs over the nutted ones that are currently on the bike. The front shouldn't be a problem as I assume it is the standard 100mm but the back may be more challenging. I haven't measured yet but I think the rear may be 140mm but will have to put the calipers on it to be sure. I will post updates on this project if anyone is interested. Trailmix, nice bike and one you can enjoy with the changes you are mentioning. As others have said, I'd get it ride-able and give it a try then you will know how far to go with your build. I'm not a fan of how the brakes are currently configured so that would be something to consider with either drop or flat bars configuration. 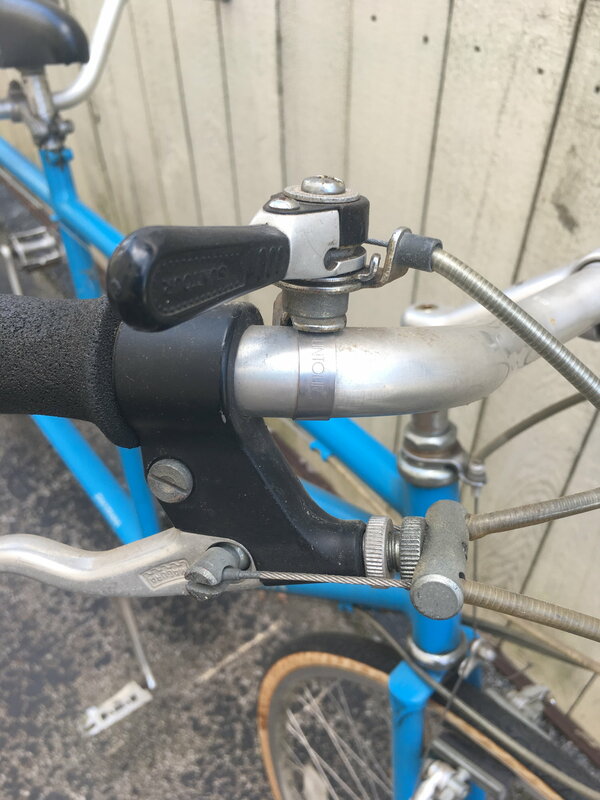 One fun thing, you might be able to use your rear shifter for your drag brake if you change to drop bars and bar-end shifters. It will be interesting to hear what the spacing of the rear triangle is. If 140 you still have opportunities with some of the tandem specialty shops. Tandems East has 140mm spaced wheels and hubs so they could probably get you set-up with a free-hub set-up for not to much. 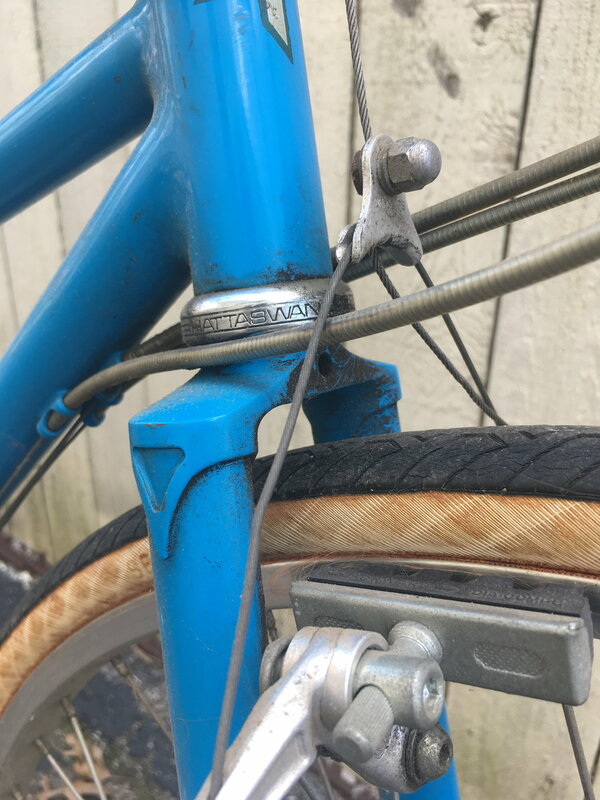 If you guys enjoy riding the bike, which is your first hurdler, moving to a 7 or 8 speed set-up would be pretty inexpensive, something like Shimano Tourney for example if you were to go new. It is a pretty bike and one that can be ridden and enjoy. I'd totally ride it as-is, then change it to my liking. I'm not afraid of the drivetrain or wheels if they're working ok. Doing the V brake conversion isn't difficult if you want to, but pretty much all tandems this age have wide cantis with the drum being an upgrade option. When I was shopping for my Burley I held out for a V-brake and SIS bike - especially the index shifting, because all the supposed charm of feeling the shift goes out the window when your drivetrain is five feet behind you and you have a partner waiting on you. Minor update. I just got off the phone with a very nice gentleman from Santana who says that my bike is a 1983 Santana Elan. He also said that the bike originally came with drop bars but all the other equipment is original. This is why the axle and dropouts should be checked now to be sure they're good from the outset. PS To the OP: yes, please do post pictures. I expect that frame to really shine after a good cleaning and waxing!!! Good luck with your project. Last edited by LV2TNDM; 03-19-19 at 01:13 PM. Well, a viente soy latte with vanilla & 3 shots is $7 at Starbucks, so 3 equals the cost of an axle. But you are right though, I forgot about labor cost. That changes my comparison dramatically. Still, I would call this a manageable expense if the issue ever occured. It sure beats a lot of other holes to dig out of. I was just trying bring the OP up to speed on potential idiosyncracies and set reasonable expectations with things not to be surprised by. If his stoker is light & floats over the saddle on bumps, the a bent axle may never happen in a million years. If the stoker weighs #350 & they have a weeks worth of camping gear...This wheel may not be the best choice. In any case, being aware of it is just good knowledge to have. I am all too familiar with the limitations of a freewheel hub, I broke a couple of axles on my 126mm touring bike until I started using a Paul’s hub. I will probably set it up with panniers on the front to lessen the load on the rear hub although that probably won’t make much of a difference in the grand scheme. Progress will probably be slow as I plan to take my time and I have a two week old newborn so I stay pretty busy. I appreciate all the advice, keep it coming as I am sure I can use it. Just gotta say......"nice grab!" If you haven't ridden a tandem with your wife before, this bike is a great way to get started! Yes, I agree. If it were mine and had axle issues, I'd address them myself and save a bunch and have a functional bike!! (And by no means do I intend to dissuade the OP from reviving this classic tandem.) However, years in the LBS have taught me how "simple" repair costs can spiral out of control to the point where the shop has hundreds invested, the customer is pissed and the bike hangs unfinished.... a terrible outcome for all. I'll add that even with a light stoker (which would prevent or reduce rear wheel impact axle damage or failure), there's still the underlying problem with power. I used to regularly bend axles on my 5-speed hub during sprints. This was a light, but strong, teenage kid who put a lot of miles on his bike. Good power, but low weight. Whereas a tandem is high power and high weight. And the weight factor relates to mass and inertia. When both riders make maximum effort, the drivetrain must accommodate a lot of force during the time a couple is trying to accelerate themselves and this heavy tandem. In other words, lots of force acting on the vulnerable axle. This alone can bend an axle, and along with it the dropout(s). Just thought I'd add that issue as well. But let's hope the OP restores this gem to its former beauty and gets some miles out of it! 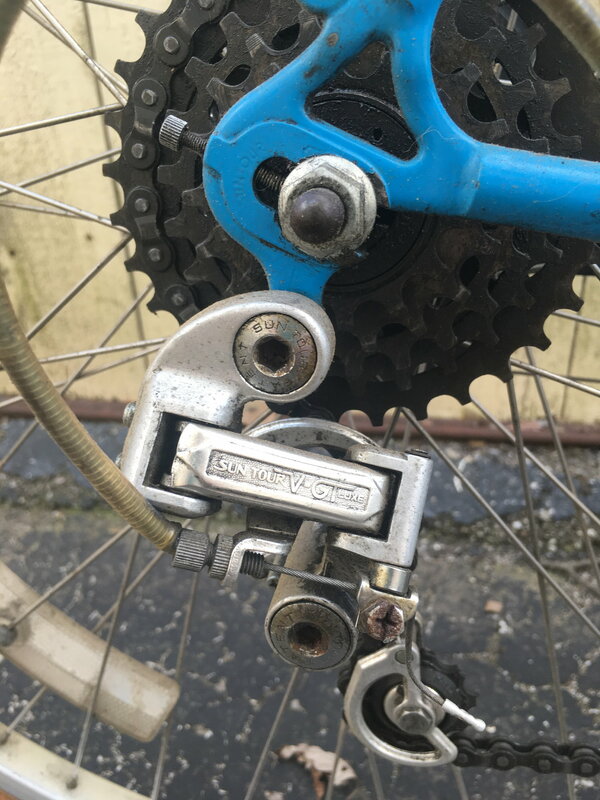 The nutted axle may be a trigger for worry, but this being a quality early-80s tandem, we can presume it's better hardware than a 70s store brand ten speed. I'm really hopeful he can just service the bearings and go have fun. I would recommend riding that bike for a year or two with only a few changes. Learn what you want in a tandem before making a big investment. We started back in 1973 with a Gitane we purchase from a teenager who had ridden it across the country. He was well supported by rich parents, which meant the bike came with lots of spare parts. It was a lousy frame that was so flexible it was difficult to stand while climbing. Still, spending two years on that bike taught us what we wanted in a tandem. Solid axles were standard issue, even on good tandems, in the old days. Partly this because quick release skewers long enough to fit 135mm axles were hard to come by. As someone already noted, tandems brake axles on hubs designed for use with threaded freewheels; however, long replacement axles are still available on the Internet. We always carry a spare when we tour. I finally got around to measuring the rear hub and it is 140mm spacing and apparently Tandems East offers White Industries cassette hubs in 140 if I do run into trouble. Last edited by trailmix; 03-23-19 at 12:52 PM.